June 29, 2013 17 comments on "Easy Cucumber Salad"
Several weeks ago I was at a restaurant and had a great cucumber salad. I’m sure I’ve had it before, but I had forgotten how good it was. I decided to try to make it for myself and I wasn’t disappointed, it was delicious! This salad only takes a few minutes to make and you can store it in your refrigerator for several months. Note: this recipe makes approximately 1 quart of cucumber salad. First prepare the dressing by placing vinegar, salt, sugar, celery seed, and mustard seed in a small sauce pan. Heat until the the sugar dissolves and the mixture begins to boil. Remove the pan from the heat and cool. Make sure the vinegar mixture is cooled off all the way before you pour it over the vegetables, or the heat will cause your vegetables to shrink in the jar as it cools off. While the vinegar mixture is cooling, slice the cucumber, bell pepper, and onion. You can use any color of bell pepper. The more color you add, the more colorful your salad will be. 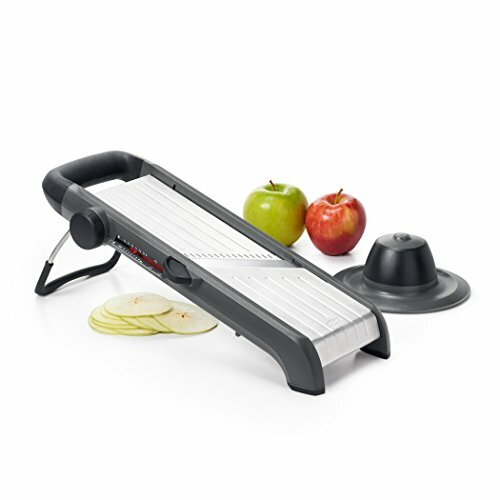 If you like your cucumbers and onions cut into nicely uniform slices, this mandolin slicer is what you need to easily cut them in just a few seconds. 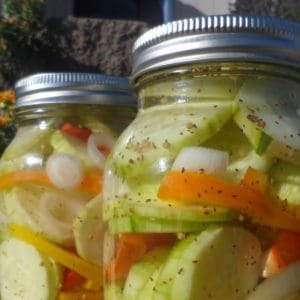 Place the sliced vegetables in a clean quart sized canning jar, then pour the cooled vinegar mixture over the vegetables, leaving 1 inch head space. Place the lid on the jar and place in the refrigerator until ready to serve. 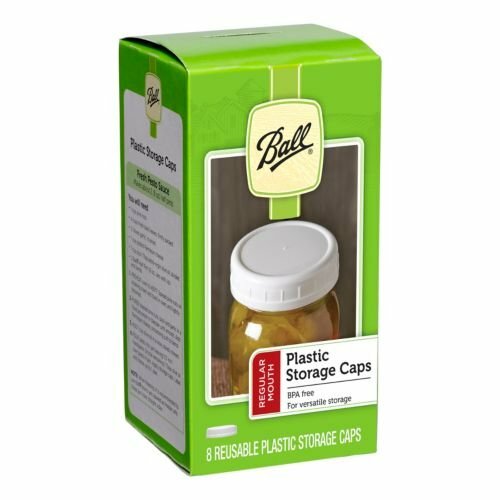 I use these inexpensive plastic canning jar lids you can order online from Amazon. They are great for storing mason jars in the refrigerator and are easy to wash and re-use. This salad can be stored in the refrigerator for several months, so make up a couple of jars at one time if you can. Don’t just take my word for it, try it. This cucumber salad is really good! 17 Comments on "Easy Cucumber Salad"
Hi! Yes, this is a sweet syrup. I also appreciate the post not having all the extras as Pearl mentioned. It is very annoying to try to eliminate them to print the recipe. Also, instead of buying all those plastic tops $$$ I have found that peanut butter jar lids fit just fine. Could the jars be transported over several hours without being refrigerated? Yes, several hours would be fine 🙂 The vinegar will keep the salad from spoiling. Could you use an artificial sweetener instead of all that sugar? Hi! Yes, you could definitely use artificial sweetener in the place of sugar in this recipe. Hi! It would be great if you could can this recipe, but the cucumbers would end up being really soft. That is why regular cucumbers aren’t very good for canning. 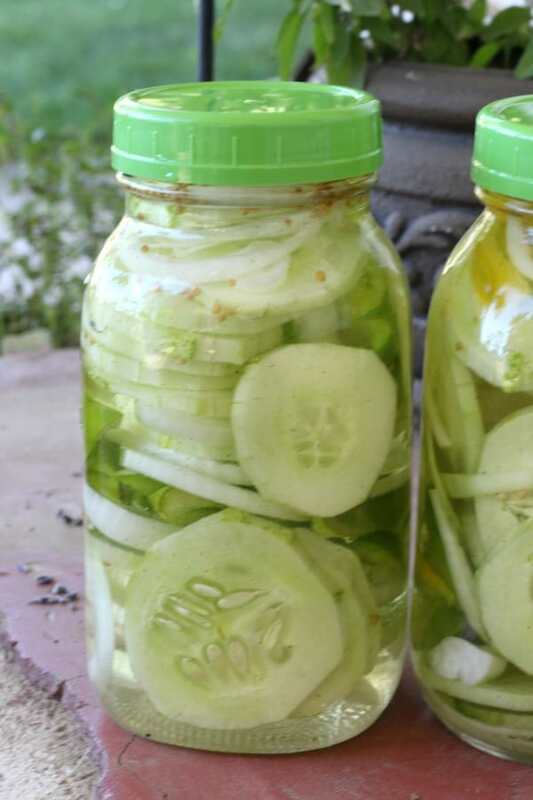 This cucumber salad will actually keep in the refrigerator for several months, so you can make a few jars and the vinegar will preserve it for quite awhile. I love this recipe and all the people at the potluck last night loved it too. When the veg are gone I have been bringing the liquid to a boil again and re-using it. Hope that is ok.
Hi! Yes, it is 2 cups of sugar. You aren’t actually eating all that sugar, it’s just in the syrup. I forgot to mention in the recipe that after you eat the cucumbers out of the jar you can just add new ones to the syrup in the jar. The syrup will stay good in the refrigerator for at least a month.